The end of the year is usually the time when we all try to look back and think about all that we have done so far and try to conclude what has to be done in the next year. After a serious consideration a decent person would admit that this year wasn’t so bad but next year should definitely be better. Especially in terms of sailing – we should all learn from our own errors and give our best to do it better in the upcoming year. From my point of view that means that we should improve our sailing skills, use the gear more efficiently, treat the yachts better than we did so far, book them earlier, plan our routes earlier, choose our companions and crew earlier etc. These decisions could come on the agenda right after New Year’s celebration, at the first boat show in the year. 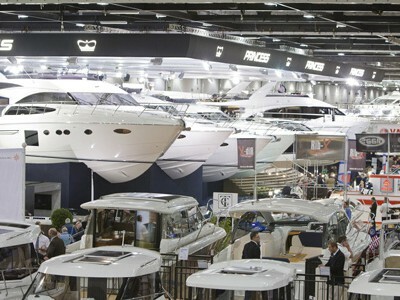 London Boat Show opens doors for 60th time on January 4th 2014 and lasts until January 12th 2014. The event is taking place in South hall of ExCeL in London, UK. The organizers have listed 14 top reasons to visit the Show but I am sure there are many more. One of the most thrilling reasons for all who are sailing race lovers would be an opportunity to see, hear and meet Sir Ben Ainslie! Current America’s Cup winner and probably the world’s greatest Olympic sailor will be taking part at question and answer session on January 8th at the J.P. Morgan BAR AC45 stand, explaining all the news and the latest innovations in the sailing sport. London Boat Show will be featuring boats interesting for their special achievements such as their historical value, exceptional sporting, ecological, charity or some other achievements that make them outstanding. Those boats will be displayed on the dock in the Marina or on designated stands inside the Show. Impressive numbers are mentioned when displayed boats were announced. Nearly 1000 boats ranging from rubber dinghies to exclusive motor yachts are expected to be displayed. In addition, since London Boat Show is the first to be held in the new year, the audience is impatiently waiting to see the debut boats which will be counted in three digit numbers. Exhibitor list is also measured in hundreds, ensuring the visitors that all major names from the marine industry will be present at the show! We wish you a successful new year full of exciting accomplishments and interesting sailing trips and, of course, a calm sea, a fine wind and a strong mast!